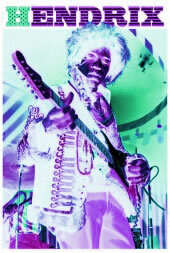 So have you heard about the Jimi Hendrix guitar that was up for auction last year? Yup, it was auctioned off by the Fame Bureau in London, U.K. on September 4th, 2008 (The Fame Bureau is known for being experts at Rock memorabilia). What's the big deal? According to an MSNBC report (which is no longer available), apparently this axe has been missing since March of 1967. It wasn't just another Jimi Hendrix guitar, though. This is the 1965 Fender Stratocaster he poured lighter fluid on and lit during a gig at the Finsbury Astoria in London in 1967. Hendrix ended up burning his hands and the guitar took some damage. Was this a drug induced stunt that ended up going wrong? Of course, if it was drug-induced, I guess you wouldn't expect it to go any way but wrong! If you happened to have an extra $1 million sitting around, you could've had a shot at a piece of rock & roll history! That's what they estimated this guitar would go for on the auction block. Now that Eddie Van Halen "Frankenstrat" Guitar re-issue doesn't look too bad at $25,000! Turns out the final auction price was $580,000. Wow, and I just shy of getting that axe by about $579,000! The interesting thing about this story is I couldn't find much information to back up the background story. I checked the official Jimi Hendrix website and couldn't find any reference to this particular hotel. I checked the Rock & Roll Hall of Fame website, and there it mentions a performance at the Monterey International Pop Festival in June of 1967 where Jimi burned a Stratocaster guitar. There's yet another news article from August, 2002 that talks about the other Jimi Hendrix guitar that had been burnt. This one was given to Frank Zappa in pieces. He restored it, played it on an album, then packed it away. The story strangely parallels the current story in that it had been forgotten about. Frank's son Dweezil found it under the stairs at his dad's studio in 1991. Hmmmm. What's more, this story claims THIS was the guitar from the Astoria hotel, which would mean the guitar auctioned was the axe Jimi burnt up in Monterey. At least the story claims the burnings all took place in 1967 - that much we have as a constant. I guess there's all sort's of unanswered questions surrounding Jimi Hendrix. No one seems to know for sure what really happened in the hotel room the night of his death in 1970, other than he drowned in his own vomit. Can't seem to get a straight story on which guitar this is - the Astoria or the Monterey torch. Confused? Me too! Oh well, does any of it matter anyway? After all, I didn't have $580,000 sitting around to buy a damaged guitar. I need one I can play, not one to sit around collecting dust (just kidding). Nope, let the collectors have the famous Jimi Hendrix guitar!